Remember Wall Street in the shining chrome-plated 80's? Impeccably dressed stock brokers raked in millions through day trading while repeating the corporate mantra, "greed is good," with zombiesque vacancy. And for the privileged few, living in a pressure cooker meant a penchant for Oliver Peoples glasses, Valentino suits, Crane's calling cards, and glass walled apartments overlooking Central Park, much like Patrick Bateman, anithero of Bret Easton Ellis' brilliant satire of elegant 80's excess, American Psycho. But I digress. Bateman's tastefully minimal apartment swathed in white, beige and white -- all the better to showcase the housekeeper's skills as well as his ultra luxurious accoutrements -- represents the apex of 80's wealthy urban living. 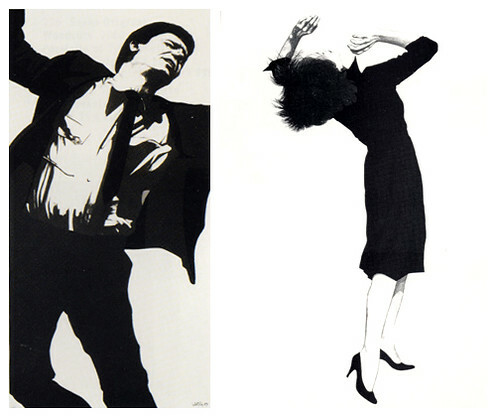 That and his life-sized Robert Longo lithographs. 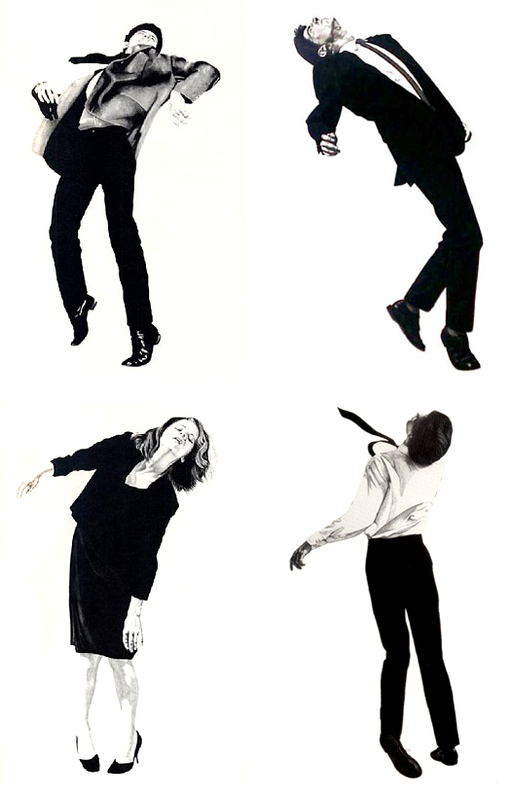 Images courtesy of the artist at Artnet. Much has already been made about the dark side of 80's greed. There's Patrick Bateman himself, a self-imagined psychotic killer, Less Than Zero's protagonist who dies of cocaine overdose in a hyperfast society driven by glamor and wealth, and then there are Longo's prints of corporate archetypes writhing against the confines of their high pressure lifestyles. 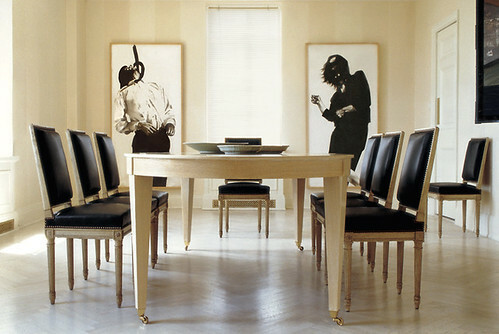 So what does it say about the state of our current society and economy that prints from Longo's Men in the Cities series have recently made a comeback on the walls of today's well-heeled homes? Tom Scheerer, master of all things beige and white, used two original Longo prints as focal points in this extremely tasteful dining room. Snark aside, I actually love it, possibly because I have been reprogrammed to URGENTLY NEED light light walls by the recent blitz of white washed everything, or possibly because the macabre side of me might enjoy the choking feeling that would come from looking at that print while eating. Perhaps it would help with portion control. Left image from Domino, spotted on M.A. Belle's lovely blog, Right image from Interior Design. That's Gretchen, and she's had a tough day. I think she is a popular choice because Gretchen's a little less edgy than some of the more obviously distressed people, and her black dress and heels are classic and therefore still au courant. In other words, she's pretty and I'd have her in my bedroom any day. Heh heh. It sure looked better in its natural beige habitat, didn't it? Way too much contrast here. Maybe there is a point to having white walls, you know, other than to highlight my lack of obsessive cleaning and all of the imperfections in my 40 year old walls, not to mention the lower than 20 foot high ceilings and complete nonexistence of decorative woodwork. Sigh. The good news is that Longo's prints are not completely unattainable. Well, the original 70" tall lithographs are (unless you have 5-7k earmarked for artwork, in which case, why don't you send some of that sweet sweet love my way, pretty please? ), but the posters are quite affordable and while they're substantially smaller, they still have graphic impact. 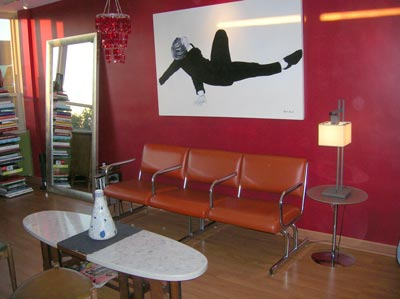 Lithographs and reproductions are available through Bird Fine Art, as well as through Ebay. So tortured and ironic. What do you think? Could you find a place in your home to do the Longo?